Letter signed by 15 organisations calls on US to impose sanctions on Rwanda over human rights abuses in DR Congo. Leading campaign groups and thinktanks have written to Barack Obama accusing him of a failed policy over Rwanda's support for rebels in the Democratic Republic of Congo, and calling on the president to impose sanctions. The letter – signed by 15 organisations including George Soros's Open Society Foundations, Global Witness, Freedom House and the Africa Faith and Justice Network – follows the seizure last month of the eastern Congolese town of Goma by a rebel group, M23. A recent report by a United Nations Group of Experts describes M23 as commanded by General Bosco Ntaganda, who is wanted by the International Criminal Court for war crimes and crimes against humanity, and under the ultimate control of the Rwandan defence minister, General James Kabarebe. In the letter, the groups said that US efforts at "quiet diplomacy to address Rwandan involvement in eastern Congo have failed to deter Rwanda's continued incursions and use of proxy armed groups" responsible for egregious human rights abuses in 15 years of conflict. "As the situation once again dramatically deteriorates in eastern Congo, the US response to the crisis has patently failed and is out of step with other western nations," they wrote. "Since the M23 was created in the spring of 2012, US officials continued to place faith in engaging Rwanda in a constructive dialogue. This approach has clearly failed to change Rwanda's policy, as evidenced by the direct involvement of the Rwandan army in the recent takeover of Goma, as documented by the United Nations Group of Experts." The criticism is likely to again focus attention on Susan Rice, the embattled US ambassador to the UN and frontrunner to be the next secretary of state. She has been at the forefront of American efforts to shield the Rwandan government from criticism over its involvement in Congo. The UN group's report says: "Rwandan officials co-ordinated the creation of the rebel movement as well as its major military operations", as well as providing troops and arming the group. It recommends imposing sanctions against Rwandan officials responsible, including Kabarebe. Kabarebe told the Rwandan parliament on Monday that the country's military played no role in the creation of M23 and accused the UN group of inventions. "The fabrication of data by the Group of Experts was done so poorly that we already knew what they were planning the next day," he said. 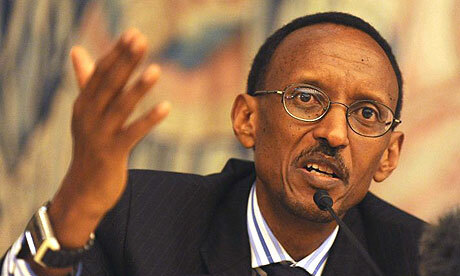 European countries have cut or suspended aid to Rwanda following the UN report. Eleven days ago, Britain announced it would stop £21m in aid after describing UN evidence of Rwandan complicity in the Congo conflict as "credible and compelling". The UK has been among Rwandan president Paul Kagame's closest allies and its decision to distance itself from him was a significant diplomatic blow. The letter to Obama urges the president to join EU nations in cutting aid and to follow a recommendation by the UN Group of Experts to impose sanctions against Rwandan officials involved with the rebels. "As a responsible supporter of the UN sanctions regime, the United States should push to impose sanctions on all individuals identified in the UN Group of Experts final report, including senior Rwandan government officials, and those individuals and entities supporting criminal networks through the trade in natural resources," it said. "The United States should cut all military assistance and suspend other non-humanitarian aid to the Rwandan government, while publicly condemning Rwanda's support for the M23." The US has already frozen some military aid to Rwanda over its support for M23. The agencies also call on Obama to appoint a presidential envoy to focus on the crisis. "Your envoy would leverage America's economic, political, and military influence to ensure that all parties fully co-operate with an international political process, and also work closely with the proposed UN envoy," the letter said. Separately, Human Rights Watch has called on the US to pressure Kagame to end Rwanda's intervention in Congo. Last month it said the Obama administration should "publicly support sanctions against Rwandan officials backing the armed group M23". "The US government's silence on Rwandan military support to the M23 rebels can no longer be justified given the overwhelming evidence of Rwanda's role and the imminent threat to civilians around Goma," said Tom Malinowski, Washington director at Human Rights Watch. "The US government should support urgent sanctions against Rwandan officials who are backing M23 fighters responsible for serious abuses." US policy toward Rwanda has been heavily influenced by guilt over Washington's failure to intervene against the 1994 genocide of the country's Tutsis. But the leeway given to Kagame comes out of understanding of the difficult political balancing act he faces as well as for the progress he has made in rebuilding Rwanda. Some of the criticism of US policy has focused on Rice, who is regarded as a leading apologist for Kagame. She served on Bill Clinton's national security council at the time of the genocide and played a part in the failure to intervene. Rice pledged to do all in her power to prevent a similar slaughter in the future after travelling to Rwanda six months after the genocide and visiting one of the massacre sites. "The memory of stepping around and over those corpses will remain the most searing reminder imaginable of what our work here must aim to prevent," she said in 2009 in a speech to mark the UN's Genocide Remembrance Day. But that has translated into largely unwavering support for Kagame. Foreign Policy magazine reported that during recent debates over M23, Rice pushed back in UN meetings on attempts by Britain and France to bring sanctions to bear against Rwanda. "It's eastern Congo. If it were not the M23 killing people it would be some other armed groups," the magazine reported Rice as saying. Foreign diplomats have accused Rice of attempting to block publication of evidence gathered by a UN Group of Experts and of watering down a recent UN security council resolution naming Rwanda as supporting the insurgent group. Those moves have ruffled feathers among a few senior US diplomats at the State Department who see Rice as having too much personal involvement in the cause, at the expense of older hands. "I have heard some kick back from some career senior officials in State because she played a key role in causing that information [in the UN report] to be delayed," said Mark Lagon, a former assistant secretary of state who is now a human-rights specialist at Georgetown University and a fellow with the Council on Foreign Relations.